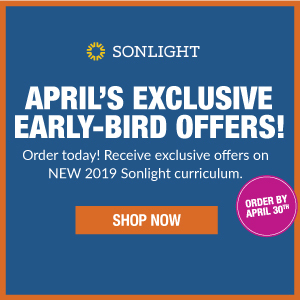 I read this article and wanted to share it with you: A 3-Part Homeschool Routine: Morning Time, Table Time, & Tea Time https://blog.sonlight.com/best-homeschool-routine.html. 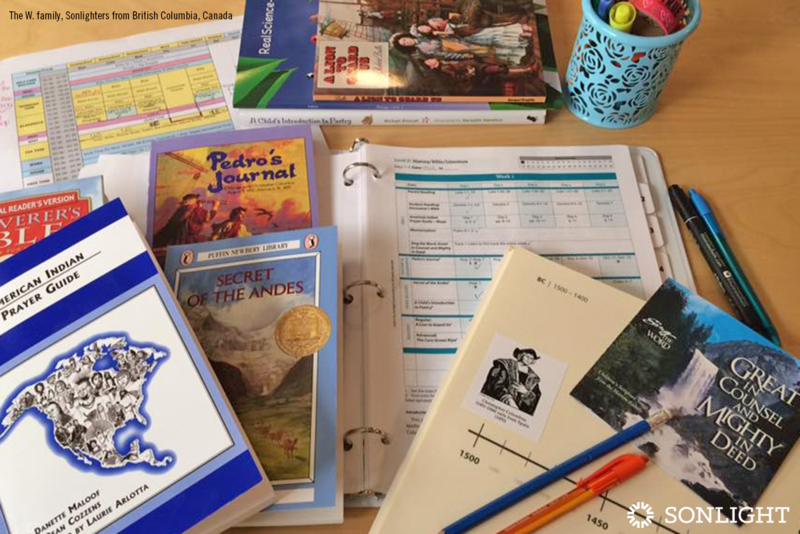 Prepping for another week of American history with HBL D.
I find that homeschool routines come more naturally and are easier to follow than homeschool schedules. 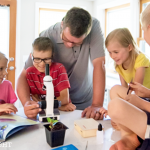 A good homeschool routine follows your family's natural rhythm, gently weaving learning time into your daily life. For example, I am not an early bird, and neither are my kids. Thus a homeschool schedule starting at 8 a.m. would be unrealistic for us. We begin our day much later than many families—even on the momentous first day back to school! This year, I had prepared a huge kick off for our first day of the new homeschool year, but I woke up at 9:45 a.m.! Can you believe that? It's true! I overslept on the first day back to school! But it didn't matter. Even though we started late, we had a wonderful day because I was completely rested. Instead of fighting my natural rhythms and need for sleep, I relaxed into them and shifted the entire day back a few hours. It was just fine! No, we didn't do everything I had ambitiously planned, but we did plenty. 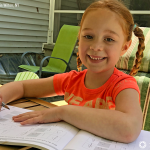 That's the beauty of following a flexible homeschool routine instead of a schedule. If I were operating by a fixed schedule, I might have felt miserable for failing on the very first day. Instead, we followed our own natural family routine, and it did not matter what time we started. 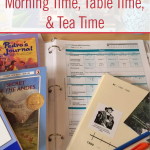 Here is a glimpse of our normal homeschool routine, divided into three parts: Morning Time, Table Time, and Tea Time. Our homeschool morning routine begins with B&B: Bible and breakfast. This is the best way to start our day as a family—putting God first. Starting our days with Bible and prayers helps my children develop a habit of daily morning devotionals. We focus on teaching our kids one character trait or habit every 6-8 weeks. Teaching our children the habits of attention and obedience, for example, has helped our homeschool run much more smoothly. 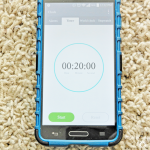 Our Table Time begins with Math because this is the time of day when my kids are fully awake and their minds are fresh. Language Arts takes the longest portion of our table time and includes these daily topics: reading, dictation, spelling, handwriting, vocabulary, and grammar. During Table Time, we alternate between History/Geography and Science, covering each subject twice a week. 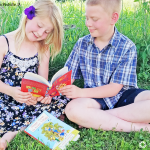 Read-Alouds are a big part of our daily homeschool routine. We leave our reading for last as a transition from Math or Science into lunch and afternoon quiet time. Tea Time in the afternoon is my kids' favorite time of the day. During Tea Time we regroup in the living room or dining room for snacks, tea, or hot cocoa. We have fun listening to poetry every day. In addition, we loop through the other topics, namely the fine arts and nature. Sometimes we even study Hebrew during Tea Time. Once a week we go for a nature walk and have tea and cookies on our way back. If we need to, we sometimes use Tea Time to catch up on a Read-Aloud. 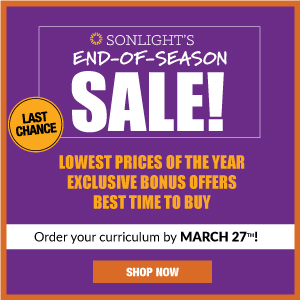 Each homeschool year—even each season—may look very different for you. So remember as your family changes, your routines may need to change as well. Don't be afraid to adjust your routine. 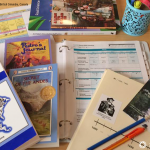 How is your homeschool routine working for you now? Do you need to tweak it to fit your family better and flow along with (and not against) your natural rhythms? 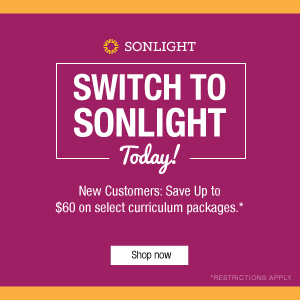 Find a rhythm for your days with Sonlight. 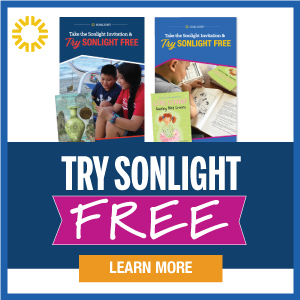 Try three weeks of any Sonlight Instructor's Guide for free. 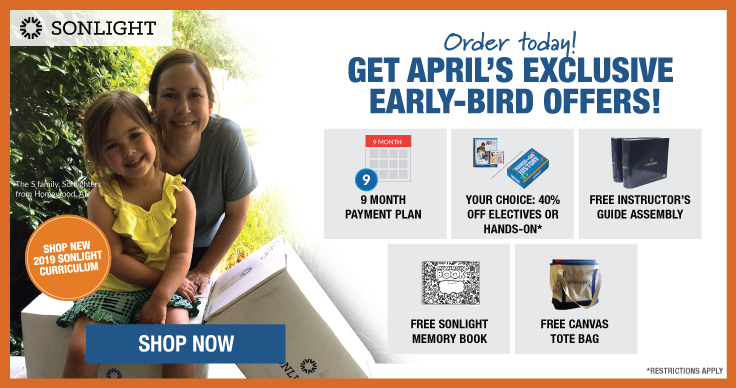 Click here to get one for any level, preschool through twelfth grade. What character/habit training do you do? Is it your own or do you use a curriculum? Thanks! I struggle with Character/Habit Training. It is so heavy on my heart. As I pray, God does open up new ideas. I just feel like something is missing. Sjone, are you using any specific books or curriculum for character training? For character building I like the website "kids of integrity". It's full of activities and bibles verses to focus on building habits of patience and kind speaking (to name a few). My kids are age 3 & 7 and I can tailor the activities to each of them. I love Kids of Integrity! This was the first character training curriculum we used with our kids. And I love that is free! I love this. I have delayed sleep cycle disorder, (meaning my body will not get tired and go to sleep until late or feel alert until later in the morning). It takes some serious will power and structure to get me up early. If I mess up my sleep hygiene even one night, it can take weeks to get me back on schedule. Unfortunately, I have lived my whole life with people thinking I am lazy or not understanding how I couldn't "just go to bed earlier". Even when I am on a good schedule and am able to get up early, I do not feel really with it until around 8:30-9. When my oldest was going to school, I noticed she has the same struggles as I do. Research is still ongoing on this disorder, but there does seem to be a hereditary component to it as one of my parents is the same way as was a grandparent. There is still so much awareness that needs to be spread about the body's circadian rhythm and how people's bodies differ. I wish that people didn't treat being an early riser as a badge of honor that shows how hard they are willing to work. But until then, I am glad we are able to homeschool and can work on our tasks when we feel at our best! Sarah, this is really interesting! Perhaps that's what every "night owl" person has? I have always been a "night owl." My brain functions so much better in the evening. Also, through the years, I noticed that I need 9 hours of sleep to feel rested. Anything less than that does not work for me. I love that homeschooling allows us to adjust our learning into our natural rhythms, don't you? About how long are each of your three times? I keep our lessons short. Morning Time takes us about 30 minutes, sometimes even less. Table Time takes us the longest, so I would say up to 2 hours. Then, another 30 minutes for Tea Time. Could you recommend some good poetry/music or art curriculum to use for tea time? Hate to be a downer, but as a homeschooler I was allowed to sleep in and have a routine instead of a schedule, and I think that this is part of the reason I struggled to keep to schedules (at work and college) ever since. I think it is worthwhile to have fairly firm waking, eating, and sleeping schedules even though it's difficult, because it will be important later on that our kids can be self-disciplined enough to be punctual.